I have been trying to remember all the fun creative learning ideas that I did when the older kids were younger so that I could do them with Little G. This year is the first year that I have really noticed just how big of an age gap there is between the older kids and Little G. I have also been remembering so many fun things that we have done over the years that would be a blast to do with her. Like making our own water colors. This was so fun. The kids thought it was so cool that they made their own paint. Mix vinegar and baking soda in a small bowl but one that can handle the reaction of the vinegar and baking soda. When the bubbles are settled, add the cornstarch and corn syrup. Stir it together until it's completely combined, the consistancy is strange if you have never used cornstarch as a thinckening agent. Put about one tablespoon into little 6 containers. The first time I used a small muffin tin. I think next time I will use empty applesauce containers. Whatever you use, it needs to be small shallow containers. Add food coloring to each container to make your desired colors. Use immediatly or let them dry overnight and use like normal watercolor paints. I have put this on my list of things to do this fall. I can't wait to show Little G how to make her own paint. I know she is going to love this project. 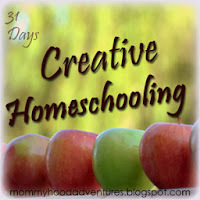 For me remembering the fun learning moments of the past and implementing them today is one of the ways I am remembering how to be more creative in my homeschooling.